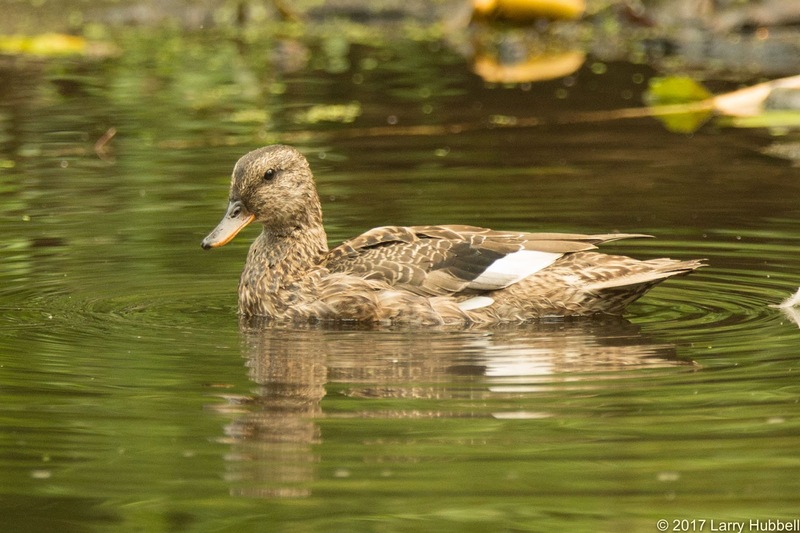 There are four duck species on Union Bay which I think of as the most well known and the easiest to identify - especially the males. 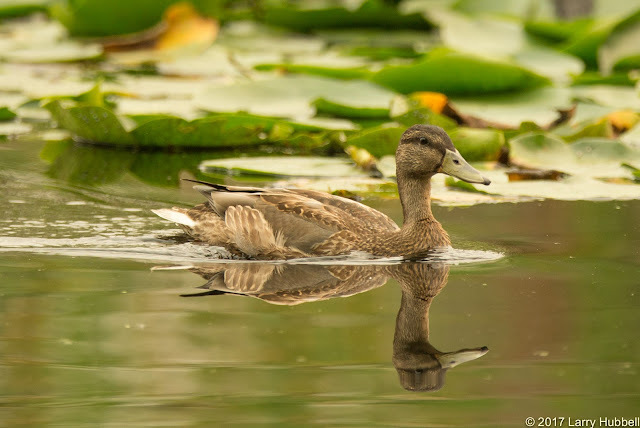 I find the male gadwall to be the most distinguished and the least distinguishable of the four species. The male northern shoveler is the easiest to identify due to its large 'shovel-like' bill. 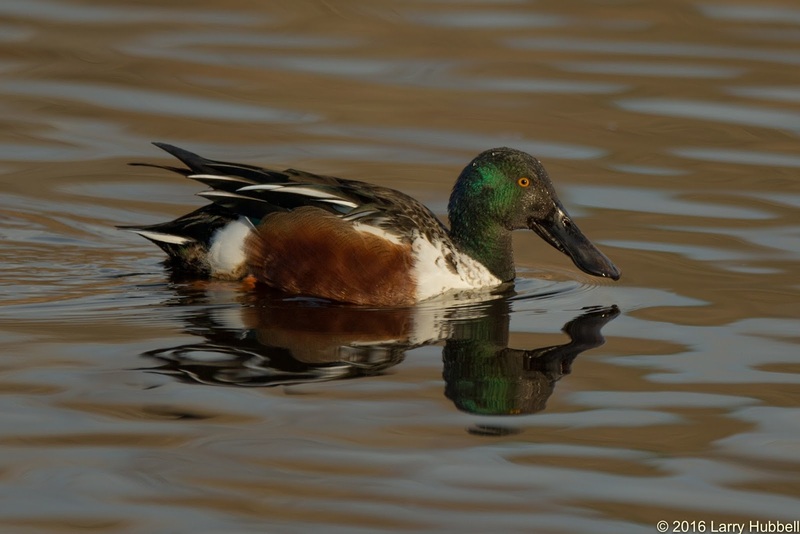 Plus, the male shoveler is the only Union Bay duck with the strikingly obvious dark-light-dark-light-dark pattern. This plumage is easily observed even at a great distance. 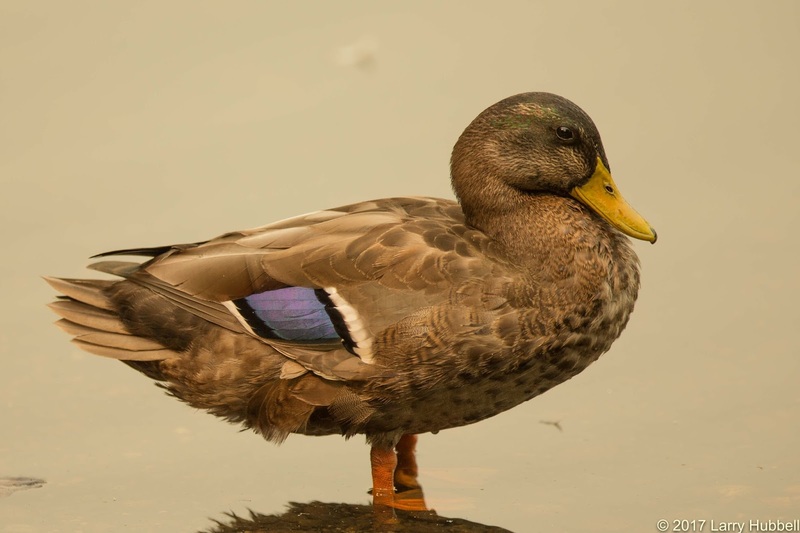 The most common and probably the best known of the four is the male mallard with his green head and bright yellow bill.. 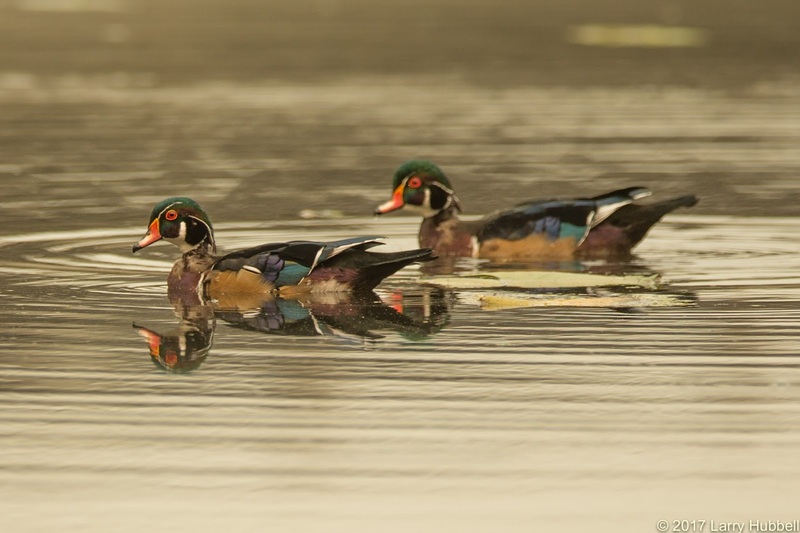 The most exotic of the four is the colorful red-eyed male wood duck. The females of each species are usually harder to identify than the males. For example compare this female gadwall with the female mallard in the next photo. 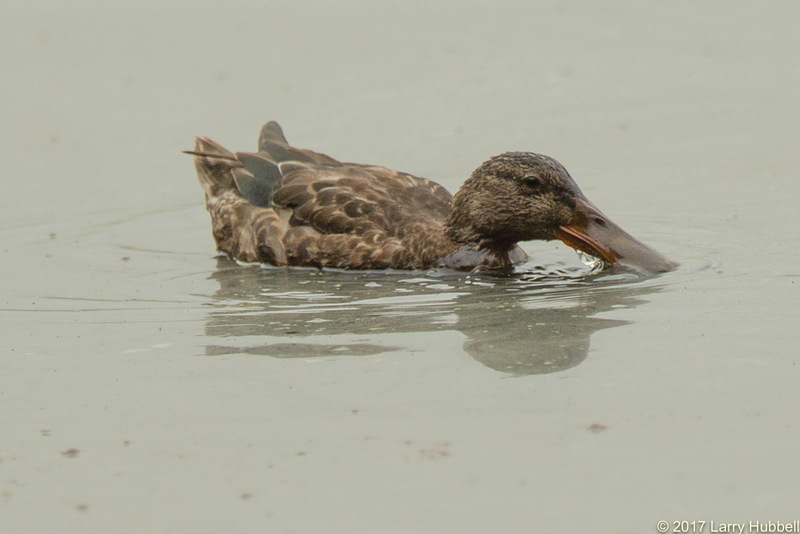 The female mallard does have a larger bill. Plus, the difference between the slope of the forehead and the bill can be helpful. This relative slope comparison is more subtle with mallards. The easiest key to their identity is the speculum. 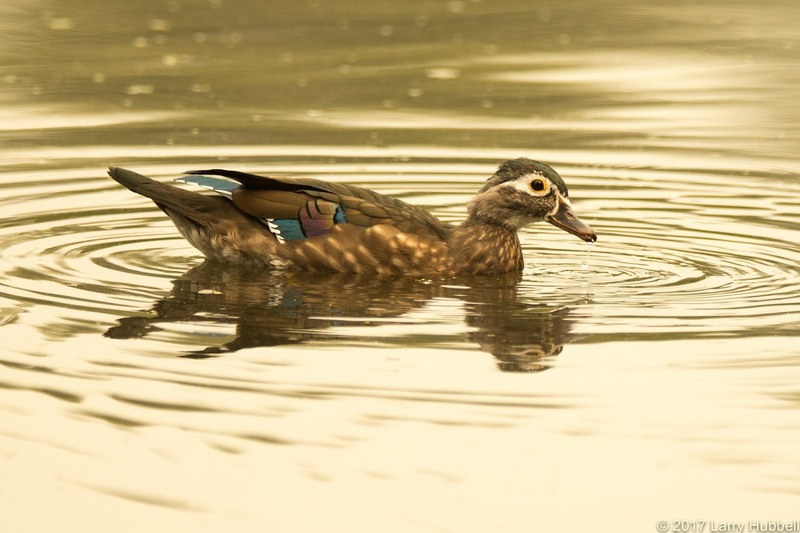 Mallards have a white-lined blue speculum. 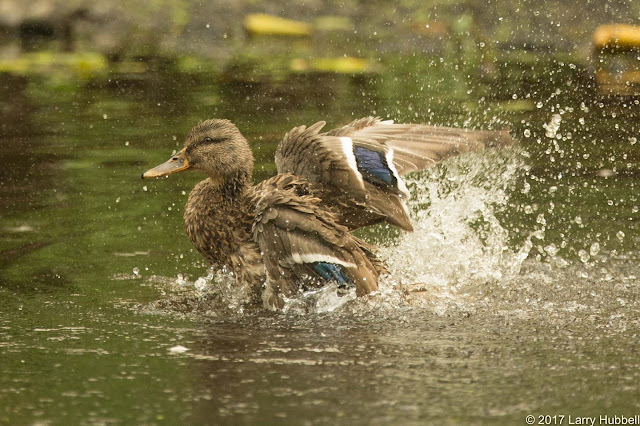 Speculums are most easily seen when ducks spread their wings. Sadly, they are only occasionally visible when their wings are folded. 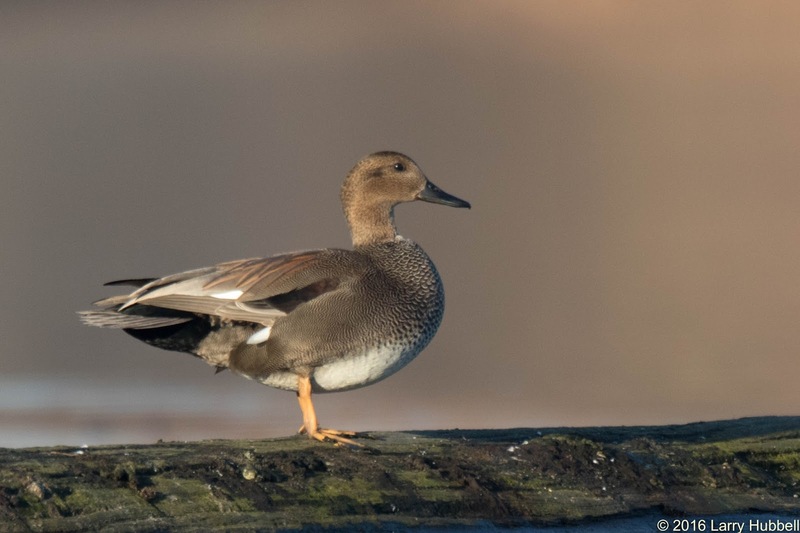 On gadwalls, the speculums are white. It is certainly nice that nature has provided these identifiable markings which differ by species. 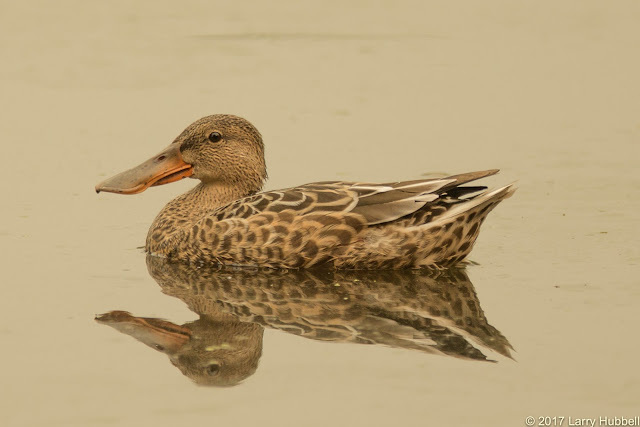 A female northern shoveler looks fairly similar to female mallards and gadwalls, but only if her 'shovel' happens to be hidden from view. It is worth noting that the inside of a shoveler's bill, the lamellae, functions like a sieve. When feeding, they push through the water, with their bills just below the surface. This is how they obtain the majority of their food. 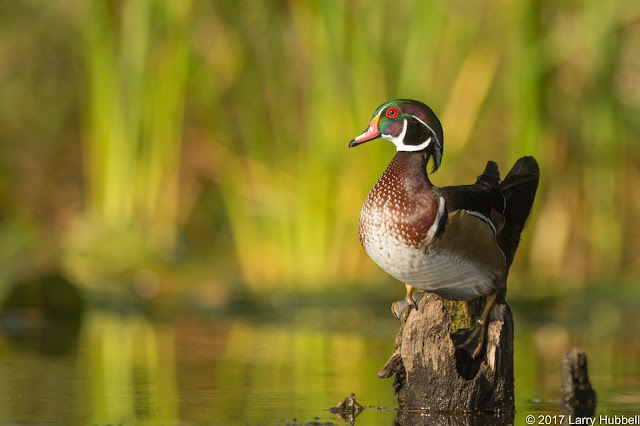 The female wood duck is the most easily distinguished of the four species. The white teardrops around the female's eyes have always reminded me of an ancient Egyptian princess. The most surprising and possibly the most difficult to identify of these four species turns out to be the males. It seems ironic to me that the males can be both easy and difficult to identify. It all depends on the time of year. After breeding season, the male's lose their brilliant coloring and switch out of their alternate plumage and into their basic or eclipse plumage. During this time they also loose their ability to fly - since they replace all of their flight feathers at one time. 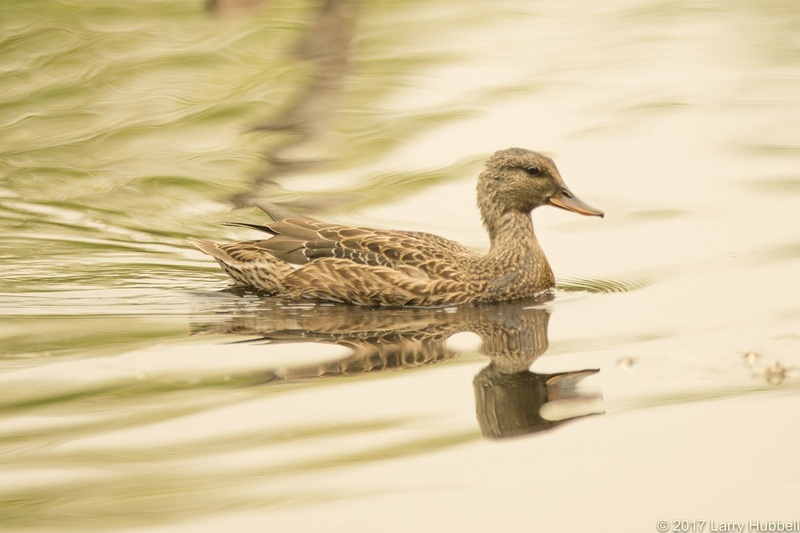 The bird in the photo above is actually a male gadwall in his eclipse plumage. This time of year the most obvious difference between he and a female gadwall is his dark black bill. It is interesting to note that most predatory birds lose only a few flight feathers at a time. That way they never lose the ability to fly. Without functional wings, osprey, eagles, owls, hawks and falcons might get a bit hungry. Since ducks feed while sitting on the water, they can get by without flying for three or four weeks. 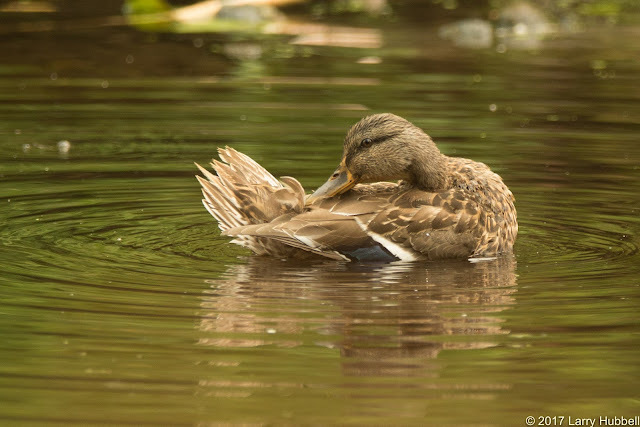 Here is a male mallard, which I photographed this week. He is just starting to regrow some of the dark green feathers on his head. However not long ago his head was just as brown as the head of a female mallard. 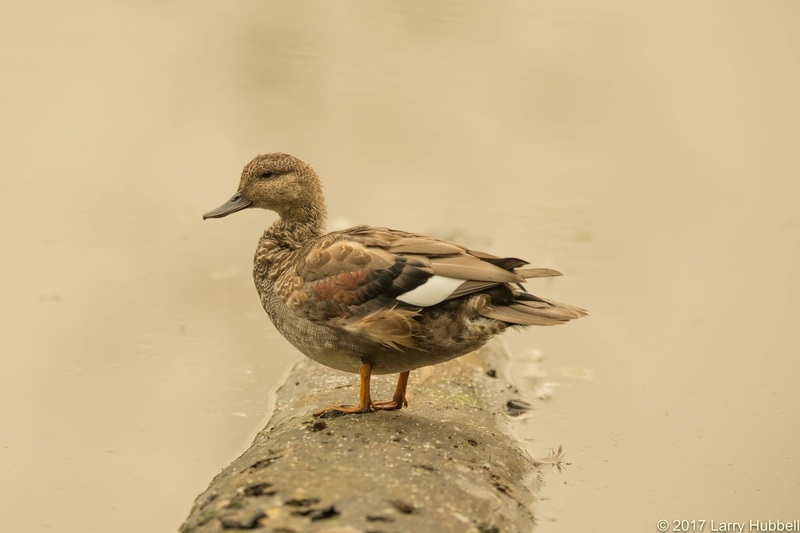 Even now the major feature which distinguishes him from a female mallard is his yellow bill. Depending on the light and the particular bird, the yellow bill can be somewhat subtle. 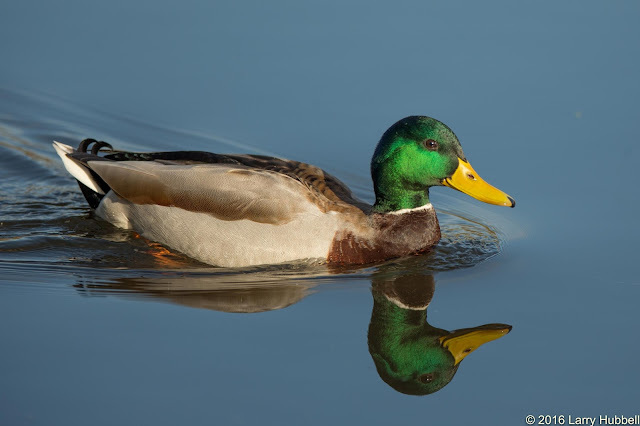 Still, among male mallards it is often the clearest indicator of the species. Particularly if the speculum is not visible and because the shape of the head, the forehead relative to the bill, can be a challenging feature to use for identification. Among the northern shovelers, the bill makes the species easy to identify. The gender on the other hand is a bit harder. The only obvious difference I know of between the male, in eclipse plumage, and a female is the color of the iris. A female's iris is dark brown, unlike the yellowish orange irises of the males. I must admit I love how this male's bill looks. It makes me think of a rich, highly polished piece of wood. 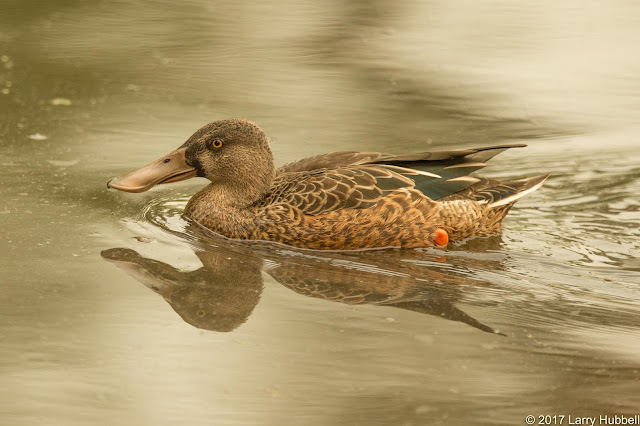 Northern shoveler's do have green speculums which can be helpful in identifying the species whenever they are flying away - especially if their bills are hidden by their bodies. ...although, they sure can look scruffy this time of year. Male wood ducks in basic plumage look quite different. Sometimes two or three of these males can be seen following a single female. My first thought was that they were juvenile males following their mother and preparing to grow their first breeding plumage. 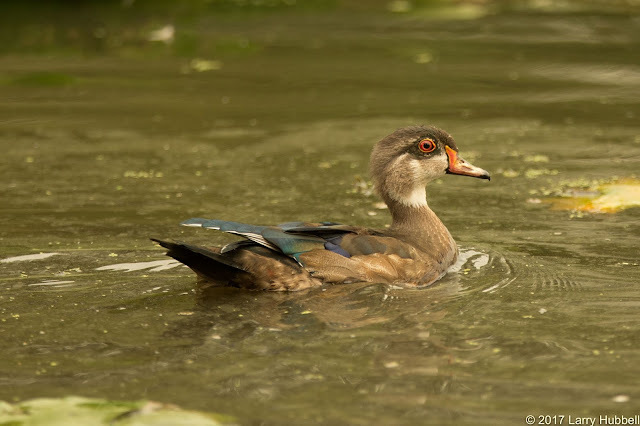 However, All About Birds tells us that during eclipse plumage the major distinguishing features of male wood ducks are their red eyes and the reddish-orange markings on their bills. 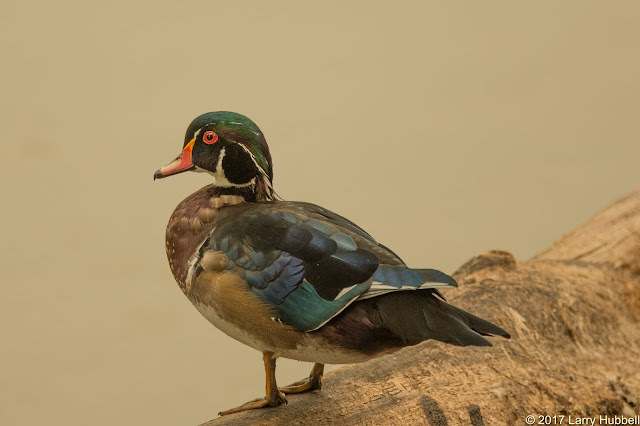 This implies to me that these odd looking wood ducks may actually be adult males in their basic or eclipse plumage. I find it amazing that this time of year our most recognizable male Union Bay ducks hide in plain sight. Luckily, by paying close attention to their bills and eyes we can differentiate the males and females. It can be easier than you would expect. After all, once they lose their flight feathers they are literally sitting ducks. For those of you who might be interested in learning more about the most wonderfully educational birding class of your life, Seattle Audubon is having an open house. Master Birder Open House – Tuesday, Sept. 12, 5 – 7 p.m. 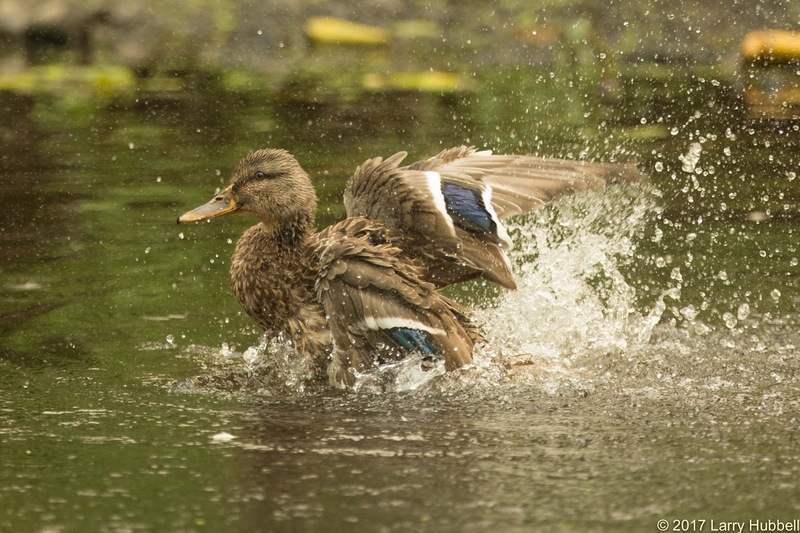 Interested in an intensive study of Washington birds, led by expert naturalist Dennis Paulson? Every other year, Seattle Audubon offers a popular two-semester, education-for-service Master Birder program. You can learn all about it at seattleaudubon.org. Applications and the application ID quiz for the next class aren’t due until March 17, 2018, and an information session for potential applicants will be held on March 6, but some people have requested an opportunity to talk with graduates of the class much earlier in the process. On Tuesday, Sept. 12, the Nature Shop will be open 5 – 7 p.m. for “suet happy hour” (two-for-one suet cakes) and an open house for people interested in volunteering with Seattle Audubon, as well as the Master Birder Open House. If you’re interested in the Master Birder program and have questions that aren’t answered on the webpage, please stop by the open house or email MBadmin@seattleaudubon.org. 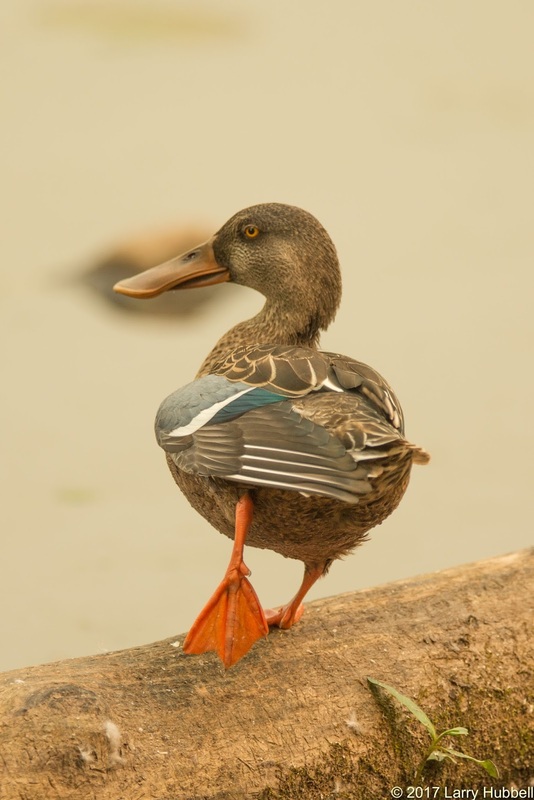 Also, have a great weekend identifying ducks on Union Bay! Can you identify this creature? 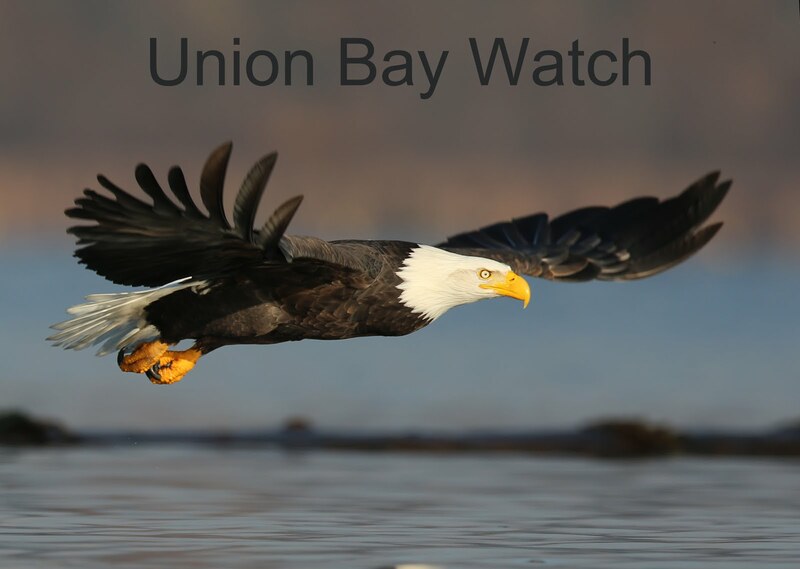 Is it a native to Union Bay and the Pacific Northwest? 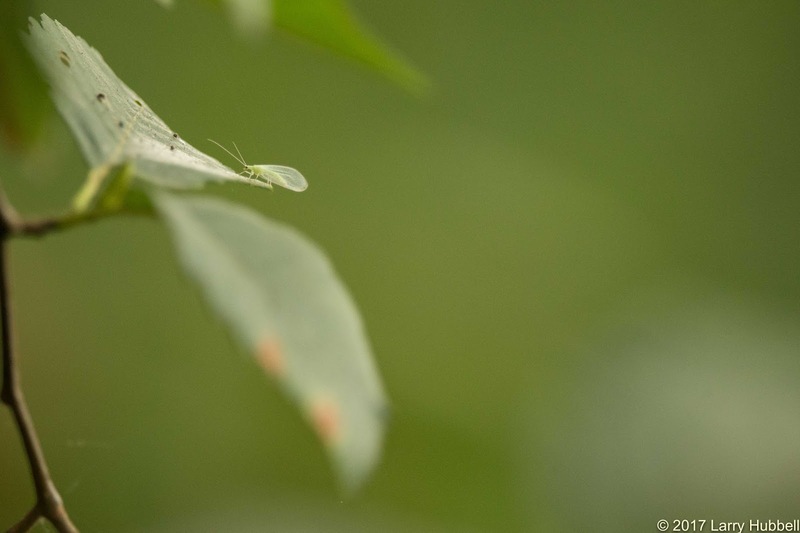 Our featured creature is a native Green Lacewing which feeds primarily on aphids. It is considered a 'good' garden bug. 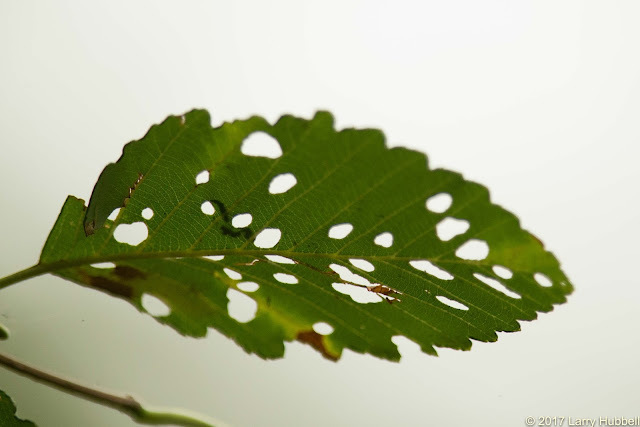 This nearby alder leaf, found on the same tree, looks like evidence of an aphid infestation and an obvious lacewing feeding opportunity. Three friends birded together. We called ourselves The Three Lame Ducks. I am the only active birder left. One is birding in heaven. Every time I read one if your posts I shake my head and think, "this guy is amazing." Thank you. For being an environmental activist, a great writer, photographer and all around good guy.